Ever since landing in Sardine and becoming the mayor (somewhere around early May, according to the Sardine Standard Calendar), I have been trying to become one with the locals. The biggest challenge has been how I don’t see eye to eye on residential zoning with my neighbors. Having a set of eyes means I see that there’s a lot of unused space – for example, 98% of the upper half of town is uninhabited for no apparent reason. It seems most villagers want to live real close to the action – so bad, in fact, they’re willing to put houses oddly close to each other despite all the available acreage in town. I guess that’s what you get when you move to a place called Sardine. I didn’t think this was going to be a problem for me personally – with all the open space around, the chances of someone popping a house down within feet of my own seemed limited. 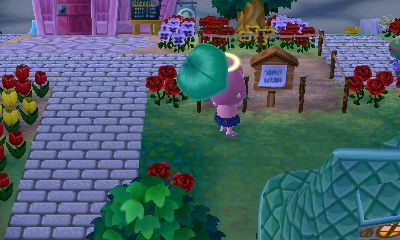 It was not long before Keaton moved in right on top of my path from my front door straight to Retail. HE PRACTICALLY LANDED IN MY LAWN. 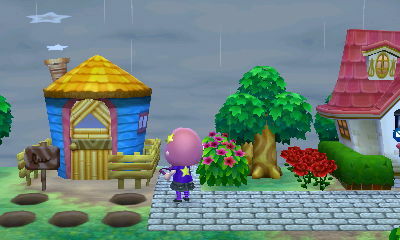 I was so mad, I dug holes all around his door so he could never leave his house. Moving in on top of a path can never be forgiven. Then I realized that if he never left his house, he would never be able to leave town … so I filled them all in again and went to see if maybe, just maybe, he was cute enough to justify the spot he took. 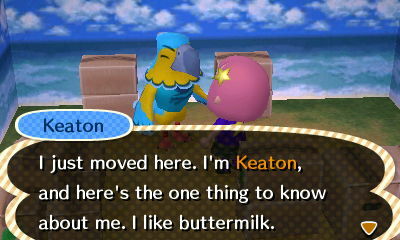 TMI, Keaton, just … ick. No. No, he is not. So I didn’t think it could get much worse than Keaton’s house. I also didn’t think you could squeeze a house in the space between mine and Retail, but I was apparently wrong.